The Style Challenge officially ended on Sunday. 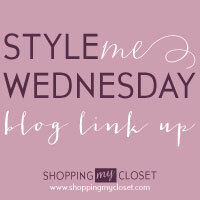 For this week's post most of the bloggers will be doing a recap, talking about their favorite outfits/pieces and there might even be some special appearances by non-blogging style challenge participants. For all of those reasons, I encourage you to check out all of their blogs (below). I'll be honest here, I wasn't organized enough to contact other participants in time to have them be a part of my post. I love the idea and I know it's going to make for some great blog posts, but that's clearly not the direction I'll be going this week. I'm going to keep it relatively simple (I'm all for simplicity these days, the less complicated, the better) and tell you about my experience and share a few of my favorite outfits from the challenge. It's really no secret that I have loved Alison's Style Challenges since they started last Spring. I've talked about the 'why' numerous times. A quick recap: money saving, direction for shopping, learning to mix and match, creating a clothing budget and MOST importantly, meeting lots of super amazing women who always have the nicest things to say. 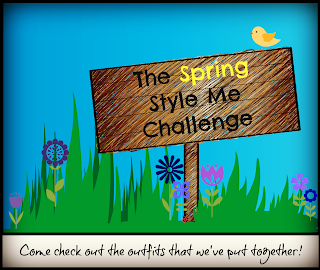 Despite my love of the style challenges, I truly debated participating this Spring. Obviously, I'm pregnant. 29.5 weeks to be precise. I definitely wanted to see what pieces would be included but I was worried about how I could/would make them work on my growing body. I was pretty sure I would sign up just to see what was on 'the list' but was not sure how active a participant I would be (in the Facebook group). 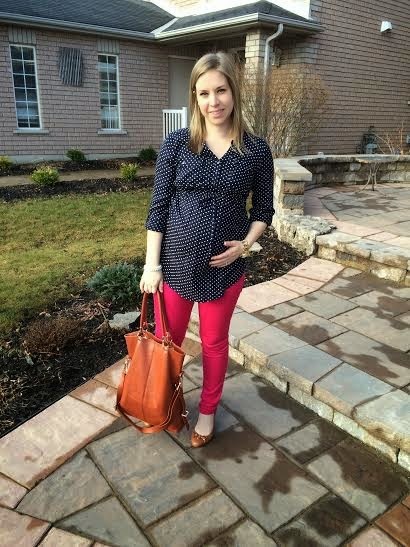 fav look #1 - printed top and colored jeans - I learned I can still rock colored pants EVEN when pregnant and they're much more fun that wearing jeans ALL of the time! When the list was released I was pleasantly surprised to be able to find a lot of things in maternity or to be able to find suitable substitutions that I felt okay with (it's also very helpful that the list always has a bunch of recommended substitutions). The Facebook group was big this time, nearing 1600 members. Most days, it was hard to keep up with all of the outfits being posted. I tried to 'like' and comment on as many pictures as possible but with so many people, it was sometimes overwhelming. I, somewhat dutifully, tried to post my picture daily. I noticed, once again, how sweet and kind perfect strangers can be. I observed, once again, how women sometimes go out of their way to say or do something to lift someone else up. It was remarkable to see women share their challenges and successes (both in fashion and life in general) and to see others relate. I didn't see one negative comment. Not one. Now, how this challenge impacted me directly? Let me tell you. Again, I'm pregnant. My belly seems to be growing daily (and I regularly get asked if I'm sure there's only one in there - yes, only one, thank you). Pregnancy is a beautiful thing, a miracle; however, it doesn't come without some challenges. Moving into the third trimester I am back to feeling tired, my back is sore, I've had issues with my sciatic, and there's all of these other aches and pains that I won't bore you with. I can live with all of these things and I'm reticent to complain because it's time limited and, let's be serious, I'm creating a human being which is pretty freaking awesome. BUT, sometimes, creating a human makes you feel like crap. Sometimes, being asking if there's two babies in there, makes you feel just plain large. So there were a few days during the challenge where I just felt 'yucky'. There were a few days here and there where, despite following the challenge, I left the house feeling crappy. There were a few days where I was tired from being up with a toddler and multiple trips to the loo (small bladder + pregnancy = multiple wake-ups). On these days, this challenge was particularly helpful to me. Not only did it help motivate me to at least attempt to put myself together but it always gave me some confidence when I needed it most. fav look #3 - striped dress - I was really unsure about a striped dress and a protruding belly but I ended up kind of loving it especially with some pops of color. Those lovely ladies I mentioned earlier never failed to lift me up on days where I felt like absolute garbage. The sweet and thoughtful comments on my pictures really changed my frame of mind some days. Not just because someone had paid me a compliment, but because I was reminded of what a precious (and time-limited) thing pregnancy is. Not just because someone said something super sweet, but because my belly pictured served to remind someone of when they were pregnant with their little one. Sometimes, it takes something so little to make someone smile, even if it is from behind tired eyes. At this point during my last pregnancy I don't remember feeling put-together at all, ever. This time around, with the help of the style challenge and these super sweet ladies, I really feel like, even if only sometimes, I'm doing okay with this whole pregnancy/non-frumpy mommy thing. It feels good. It's kind of nice to still feel like I have some semblance of some kind of 'style' even though I look like I swallowed a beach ball. Looking back, I'm so so happy I decided to participate in this challenge. I have a cute maternity wardrobe to pass along to some lucky lady AND despite all of the physical ails of being pregnant, I'm actually really enjoying being and looking pregnant (the majority of the time). You have mastered maternity style! All of your favorites are some of mine as well! It's so great that there was an supportive group of women to get you through those yucky days! You always look amazing! yes, and even though you weren't in the group, your sweet comments have made me smile on more than one occasion! Hi! Just came across your blog and LOVE it! You have great style, and I also wanted to wish you a big congratulations on your pregnancy! Can't wait to follow along on the last leg of your journey. thanks for visiting!! I will pop over and return the favor! You ladies are the best motivation for me!! You rocked this challenge! I loved seeing how you changed things up with the maternity looks. Of course the camo leggings are my absolute favorite look! thanks so much, I'm busting out the camo leggings again soon (just probably not to work) because they were such a hit! OH my gosh, you my friend are gorgeous! 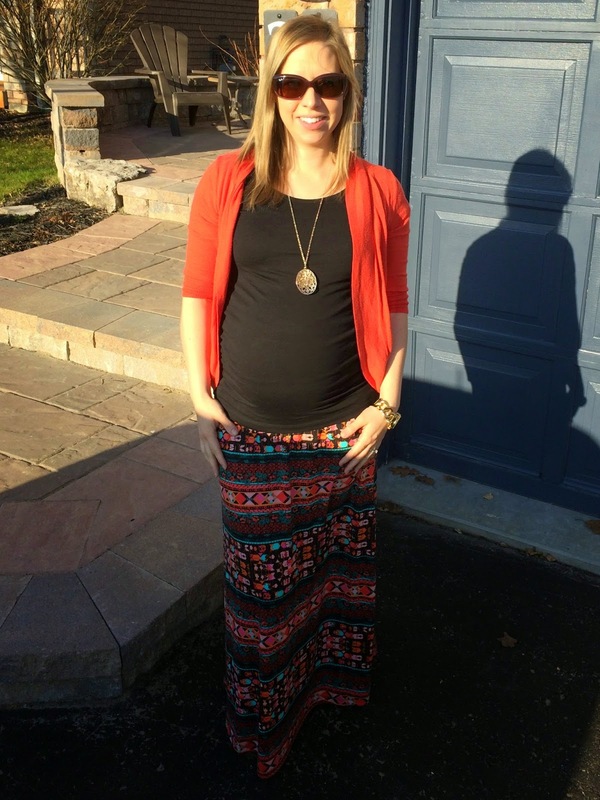 You do pregnancy well, and all of your maternity stuff is SUPER cute. I loved the striped dress and the camo leggings outfit the most...Good luck with your last tri. Baby is almost here! I know, going by WAY too fast! You nailed looking awesome while preggers! You hit the nail on the head. So glad you posted maternity versions of the Challenge outfits. It goes to show that being stylish is possible at every size and every stage of life (and even with every budget). A great style transfers from juniors, petites, misses, women and maternity sizes. So glad participating in the challenge this spring turned out to be a blessing to you. You are an inspiration to mommies and mommies to be! you ladies are a blessing for me!! thanks for your always encouraging words! You seriously have the most wonderful maternity style. 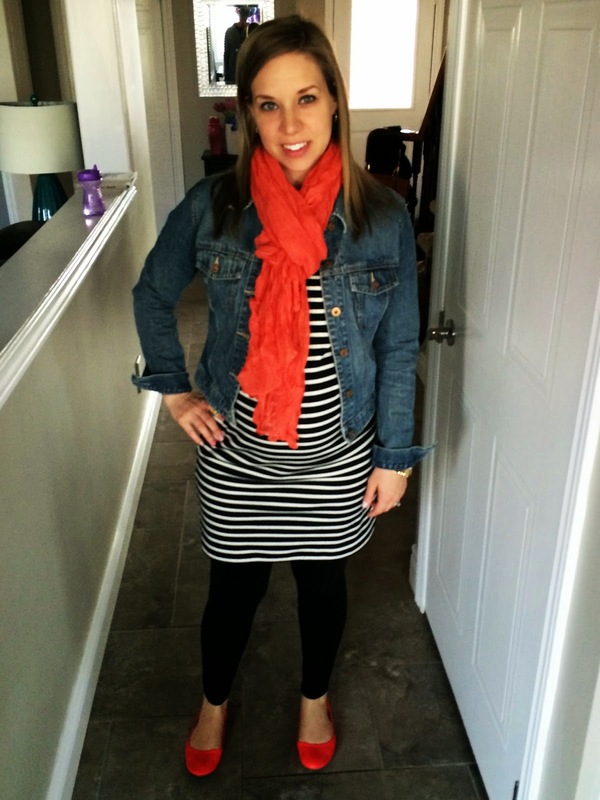 When I was pregnant I had one dress and two other outfits that were on rotation the whole time. I'm pretty sure my husband wanted me to burn them once the boys were born! I'm so glad you decided to do the challenge and you looked beautiful in every outfit! thanks so much Lana, it means a lot! You always looked great! I really like your striped dress outfit with pops of color. You are the hottest preggo lady ever. Honest - I see a lot of them (does this make me sound weird). What you wearing for your photos? i think I replied by email.. as fun as this challenge has been, I'm having such a hard time picking what to wear for pics! HELP ME! You are beautiful! I've never understood why anyone thinks it's ok to comment on the size of a pregnant woman. We get it, we're bigger than usual, but that's what it takes to grow a human! I just had a baby 8 weeks ago so those aches and pains are still fresh in my memory, I feel for ya momma! I know, the things people will say is so funny! You really are a rock star, you did great with this challenge. My absolute favorite look is the one with the camo leggings!! You look beautiful in all of the outfits! My favorite looks are #2 and #4, I am just in love with them. I think I will be wearing long skirts more this summer because it looks so comfortable and pretty. thanks so much, long skirts are my fav! You are adorable in every look! I think my favs are the maxi skirt & camo leggings. thanks Carrie, I love that my 'comfy' looks are a fav!! i'll keep my eyes open for ya!